Dr. Holger, thanks for taking the time to answer my questions. Firstly, how did it feel when you saw the first detailed OSIRIS images of the nucleus of 67P? As I said, it was a very emotional moment. And I felt it was a historic moment, the first time ever a human eye saw a comet nucleus with unprecedented resolution. On “Arrival Day” you showed us a few more images taken by OSIRIS. What were your first impressions of the comet when you saw those? Well, the comet is so full of unexpected features, it will revolutionize our understanding of activity and how comets evolve. The first impression was simply: wow! A week after “Arrival Day”, now things have calmed down a little, what are your thoughts on what you’re seeing on the images? It looks like a very complicated body with a very troubled, dynamic and violent past? It is a complicated body indeed. We see traces of its past, or what we think are traces. We start seeing activity, aiming for the link to the surface structures back-projecting the jets to potential source regions. Have you been able to use OSIRIS images to calculate the dimensions of 67P with any more accuracy yet? No, not yet, the body is complex, we are working the update of the shape model to higher accuracy. It was surprising to see how well the first determination of dimensions matched the Hubble data from light curve reduction, just about 200 or 300 meters off. We have a good volume from our first shape model, it will not change dramatically with the improved data. With the mass determined by RSI on Rosetta, we’ll soon have a bulk density, which is important for interpretation of the surface morphology, and the mission dynamics. Out here in the “space enthusiast community” we’re loving seeing a new Rosetta NAVCAM image every day, it really does make us feel like we’re flying alongside Rosetta, seeing the comet turning beneath us. Are there any plans to release OSIRIS images more often? We’d love to see them! I know, we are sharing the same interests. NAVCAM helps following, and more and more instruments are now coming up with first results. We will release images more on scientific grounds now, and have to find a balance between analysis, publication and sharing. I am optimistic that we will manage. Priority now has landing, preparing the data products for the lander team to make the right decisions. When 67P begins waking up, will OSIRIS be able to see details in the jets and plumes which form? Might you be able to actually see pieces coming off the nucleus? The comet is awake now. I have shown first jets last Wednesday, we get first feel to localize the jets and back project them onto the surface. The dust detector on board sees first grains. Hope we’ll see more activity soon in limb view close-ups. A more technical question: at Rosetta’s closest point to 67P, what will be the size of the smallest surface features OSIRIS will be able to resolve? Will it be able to see Philae after landing, like NASA’s HiRISE camera can see the Mars rovers on Mars? The scale is 2cm pixel resolution from 1km distance with the narrow angle camera. The closest point to CG is still in discussion, depends on gas drag force to the spacecraft, and thus trajectory uncertainties. We hope to get as close as 3-4 km in close fly-bys, giving 6-8cm px resolution for short times. The lander overflights will likely be done from about 10 or 20km distance, so we will see the lander by 6-12 px across, not as high res as on Mars, but we will see it. We will look for it. We go for occultation obs calibrating inside coma. We will check for solar system objects, good point. We got Saturn in view during Lutetia fly-by, were surprised by that, did not check in advance. More personally, have you yourself always had an interest in comets, or is your interest purely scientific through Rosetta? I’m wondering if you observed any comets in the sky when you were younger? Any particularly special memories? I followed Halley watch, felt comets were so special by their nature of active objects, evolving, carrying the volatile stuff in. The special moment was when realizing how close comets are to human life, my life, and the evolution of this planet. I imagine you must be proud to be part of a mission following on from the historic GIOTTO encounter with Comet Halley in 1986? Proud is not the right word; I feel touched and emotional to be part of this great team that follows Halley. Rosetta carries a lab to C-G and will allow following the questions raised by Halley fly-by, and raise new questions. I hope it will help understanding our solar system, and the early days, a little better. The new image(s) of 67P released on Aug 14th are simply stunning, and show a wealth of detail. Can you tell us – approximately – the size of the larger “boulders” seen on the ‘neck’ of the comet there? We have not checked for the size of the ‘boulders’ on the neck yet. We checked another area for boulders though and found a max ‘boulder’ radius of 15m there, so I would use this as an approximate for a max ‘boulder’ size on C-G. 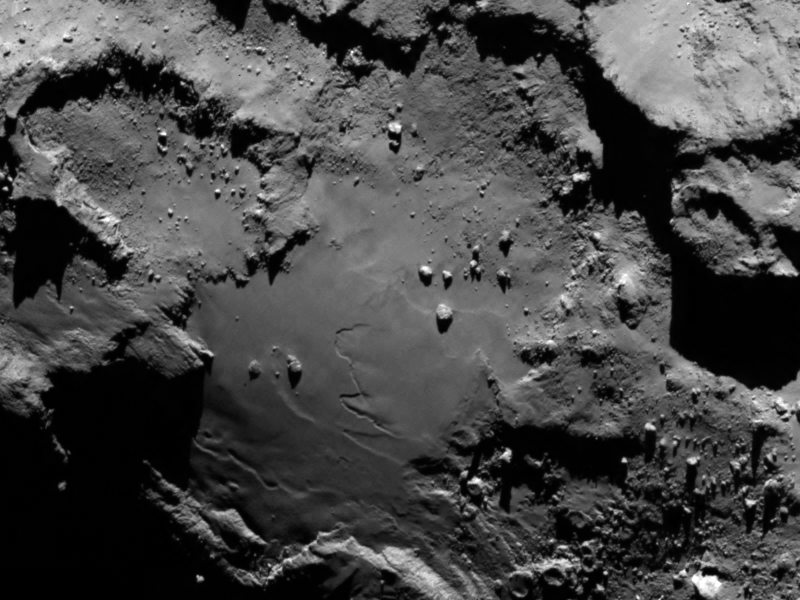 The search is on now for a safe but interesting landing site for Philae. How often is OSIRIS taking images pf 67P now? Once daily? Several times a day? One every several days? Concerning the landing site search: we will run 3 images sequences with decreased distance to the surface from about 70-50 km, 30 km, and 20 km distance. These sequences will last a good week each with significant gaps for the distance change. We will take several images a day for the merging of images. And how often are you imaging 67P with OSIRIS at the moment? Well, this is it on surface imaging, at the moment and up to landing. There are days with no imaging, days with WAC in support of navigation, days with calibration on stars or simply bias and darks, and days monitoring in gas and dust on regular basis (every 2 weeks right now). We carry limited lifetime items, so an image more now is an image less later in the mission. We thus need a good rationale to take an image to begin with. Agree with what is said hereabove : BAN Holger Sierks from any interviews until he releases the OSIRIS camera images. He made NO release yet (even of a few images through ESA’s Press releases) : it’s a real scandal, knowing that his salary and the OSIRIS experiment is paid by us, as taxpayers ! Yes, shame on you Holger Sierks ! I ensure the audience that I IGNORED the Sierks interview. express anything of scientific significance so far. Kudos Dr. Sierks. Continue to strive and inspire.